Chile squeaked past Ecuador to claim the first Copa America 2015 triumph, courtesy of goals from Arturo Vidal and Eduardo Vargas. Mena doesn’t play both positions simultaneously, therefore Claudio Bravo was in net. Jorge Sampaoli’s side operated in their expected 3-4-2-1 with Alexis Sanchez spearheading the attack ahead of Jorge Valdivia and Vidal. Jean Beausejour and Mauricio Isla started the match as advanced wingbacks, while Marcelo Diaz and Charles Aranguiz sat in midfield. Gustavo Quinteros, the new man on the block for Ecuador, is without star player Antonio Valencia for the entire tournament, but persisted with the nation’s reliable 4-4-2. Enner Valencia and Miller Bolanos formed a strike partnership upfront, with Jefferson Montero and Fidel Martinez on the flanks. Christian Noboa was also handed a new partner in midfield, as Osbaldo Lastra made up the other half of the midfield duo. This match distinctly typified both sides – Chile’s energy pegged Ecuador into their third for extensive periods in the first half, with Quinteros’ men defending near their box. Oddly, both sides opened up in the second half, creating their best chances in transition – the Ecuadorian’s squandered legitimate opportunities late on and were punished for two mental lapses. Stylistically, Chile may be the most exciting football side over the past five years, and their energetic start was slightly anticipated. Sampaoli’s men press higher up the pitch to break into tackles and possess dynamic attackers capable of making penetrative runs and evading challenges towards goal. Ecuador, however started the match flat, and within the opening three minutes could have trailed by two goals. The moves, though, were quite contrasting: Aranguiz found Valdivia between the lines, thus leading to Sanchez darting past a few challenges to slide the ball wide of the net. Shortly afterwards, a simple Valdivia lob to Sanchez saw the Chilean audaciously attempt to chip goalkeeper Alexander Dominguez. The one recurring theme in Chile’s buildup throughout the first half involved Valdivia’s movement in Ecuador’s third. Without a legitimate centre forward upfront, Chile relied on Sanchez’s diagonal runs behind the defence, and Vidal charging into space from midfield. Valdivia also charged into this space once to control a ball from Gonzalo Jara once in the first half, but for the most part his movement involved the attacking midfielder drifting laterally behind the Ecuadorian midfield duo, or dropping deeper into midfield to obtain the ball in midfield. Ultimately, Lastra and Noboa were overloaded 4v2 in midfield, and failed to prevent Valdivia from receiving passes between the lines. However, the downfall to the Chilean’s movement was his final ball. Despite starting the game superbly in the final third, majority of Valdivia’s passes were unsuccessful – he completed 73% of his passes throughout, and although many were penetrative, the Chilean’s decision-making was poor. This in result thwarted Chile’s approach. Frickson Erazo or Gabriel Achilier followed Sanchez when he was in search of the ball, but with Sampaoli’s men particularly reliant on runs behind the defence, Valdivia’s poor passing limited their territorial dominance. Surely, Valdivia’s productivity proved beneficial to Ecuador in the first half, but this was further warning that their defensive shape was often substandard. 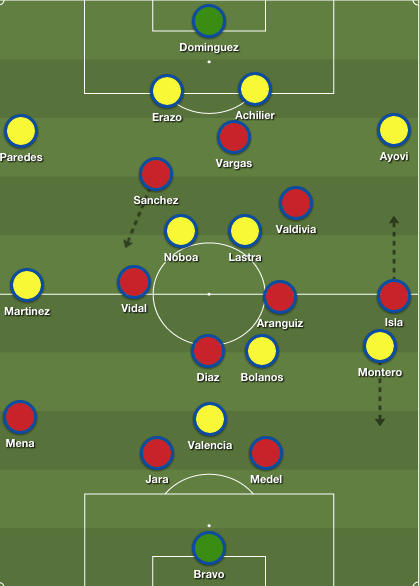 They dropped into two banks of four when Chile monopolized possession in the final third, yet occasionally dropped into a 4-5-1 with Bolanos aiding Noboa and Lastra in protecting central areas. Sampaoli’s decision to operate in a back three ensured that the hosts could play out of the back with a spare man, but they found joy in wide areas due to Vidal’s movement and the advanced wing-backs. With that being said, while Ecuador’s shape wasn’t necessarily impressive, the centre-backs admirably coped with crosses from wide areas, and limited Sanchez’s space to test Dominguez. Still, apart from the early spell of pressure, the hosts found it difficult to create goal-scoring chances. The intricate combination passes into tight areas was remarkable, but rarely did Sampaoli’s men successfully complete the final ball. However, in the latter stages of the first half, Chile’s persistence on stretching the pitch proved successful. It was evident from the first whistle that Beausejour and Isla were instructed to stick near the touchline in an advanced position. Likewise, when Vidal wasn’t charging into the box, the midfielder stormed into these positions to combine with the wingbacks. Vidal’s movement into these areas maintained balance, but also ensured Ecuador couldn’t remain compact in central areas for lengthy spells. Yet within a two-minute spell Vidal was involved in overloads with Isla and Sanchez. The first opportunity was a lovely passing move that saw Vidal back heel the ball into half space for Isla, but his cross was cleared. Then, Vidal’s initial forward pass enabled Sanchez and Isla to combine, but the right wing back curled his shot wide of the net. Isla offered Chile an outlet down the right with his advanced movement, whereas Vidal drifted into these areas to maintain balance and create overloads – it appeared a plausible route to goal following an underwhelming first half. The second half was completely contrasting to the first in terms of the tempo and structure of both sides. For the most part, the match was fairly open with both sides taking turns breaking into space on the counter to launch attacks. Perhaps this benefited Ecuador, who in fairness improved substantially in the second half. The lone chance to attack on the counter was wasted, and the attempts to bypass Chile’s midfield and defence with simple conservative passes proved unsuccessful. Quinteros possesses the personnel to play a direct brand of football, which partially explains why Montero was positive in brief spells throughout, serving as Ecuador’s sole attacking threat in the first half. Apart from a lackadaisical mistake from Diaz, which led to a Martinez shot on goal, it was Montero’s dribbling that steered Ecuador towards goal – unfortunately, the winger’s crosses were underwhelming. 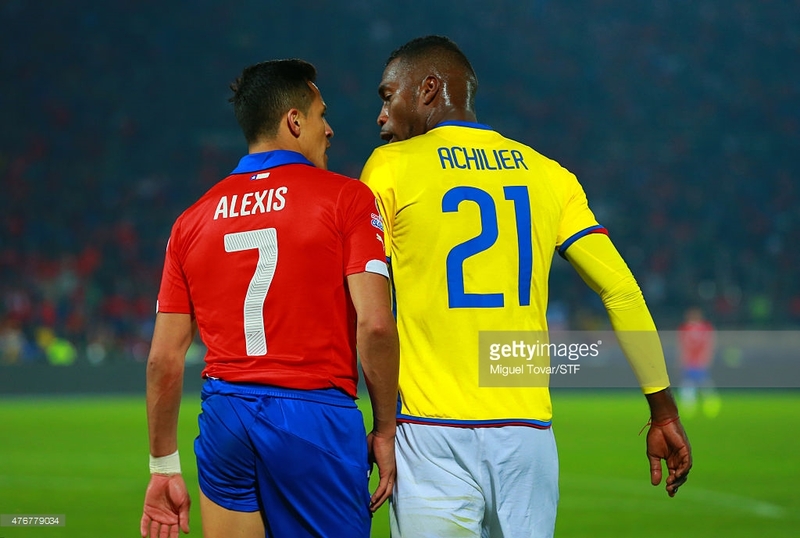 Alexis Sanchez of Chile discusses with Gabriel Achilier of Ecuador during the 2015 Copa America Chile Group A match between Chile and Ecuador at Nacional Stadium on June 11, 2015 in Santiago, Chile. Montero simply drifted into space behind the advanced Isla – who operated as a wingback in the first half, and a natural right back in the second – before charging into dangerous areas. Valencia, though, was arguably Ecuador’s best player in the second half. Frankly, this should have been Quinteros’ initial approach. Valencia exploited his physical and aerial superiority against a diminutive Chilean defence – nodding a free header off the crossbar in the latter stages of the second half – but his overall influence improved, as balls were constantly played into the striker to lay off to his teammates, allowing them to push forward and peg the hosts back. Likewise, the Ecuadorian striker was involved in his side’s best moves. Great combination play and use of half space between Ayovi and Valencia saw the latter fire a shot inches wide of the net, whereas Lastra’s ball recovery in midfield led to the midfielder clipping a pass over the defence for the Ecuadorian striker, who nearly rounded Bravo to equalizer. The decision to quickly launch balls into Valencia and Montero troubled Chile on a few occasions, and it equally provided Ecuador with an outlet to maximize the talents of their top players. The other noticeable tactical move saw Chile move from a 3-4-1-2 to a 4-3-3, which has been a common alteration under Sampaoli. Eduardo Vargas replaced Beausejour to join the attack, further pushing Vidal into midfield. 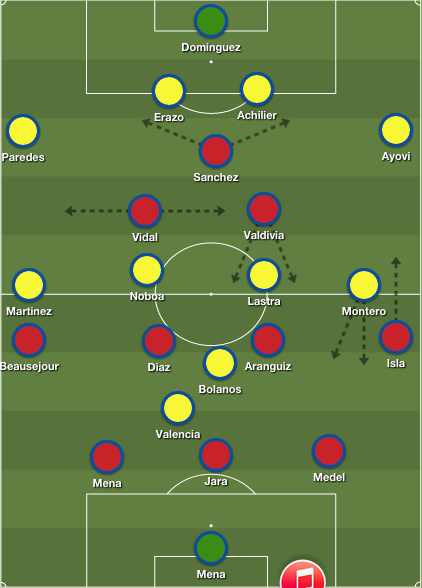 Although there was no significant change to Chile’s threat in open play – with Isla in an advanced position, there was arguably more space for Ecuador to break into – the fast paced second half saw Sanchez grow into game as he dropped deeper off Vargas to receive the ball. Sanchez ignited two breaks that resulted in a Vidal shot flying over the net, and the Chilean attacker sliding a pass into Vargas, but his effort was parried away by Dominguez. The open game and move to a 4-3-3 offered Sanchez the space to run at defenders, opposed to his role in the first half where he was constantly fouled when he successfully evaded challenges on the half-turn. A poor pass from substitute Renato Ibarra led to Sanchez running at the defence to create Vargas’ winner: surely, the goal was created from a mistake – both Chilean goals were preventable – but had this been the first half, Sanchez would be looking to receive a pass, and it’s uncertain as to whether he would, further showcasing one of the few benefits to the move. Chile reverted to a back trio once they took the lead, transitioning into a five-man defence when Ecuador maintained possession. Matias Fernandez – who received two bookings within a 20 minute span – replaced Valdivia was an expected change as the latter’s fitness prohibits him from completing many games, whereas David Pizarro made a brief appearance in the final 10 minutes. Quinteros appeared content with Ecuador’s progress in the second half, as his two changes followed Vidal’s winner from the spot. Pedro Quinonez and Ibarra offered the required dynamism in midfield – however, apart from a late squandered Valencia opportunity, neither player could ignite a comeback. This game went as expected – a tough fight for an exciting Chilean outfit that struggle to score goals, due to a shaky defence and the lack of a reliable striker. Chile was dominant in brief spells, throughout, but they didn’t create enough chances in the final third, instead capitalizing on simple Ecuadorian mistakes. Ecuador’s approach, on the other hand, was quite peculiar. Perhaps the initial goal was to play reactive and cope with the expected pressure from the hosts, but they inevitably improved when they employed a direct game. Stylistically, the second half epitomized the way the Ecuadorians should approach this tournament. They aren’t blessed with creative playmakers in central areas, but can rely on tricky wide players and an imposing centre forward – crosses into the box should remain their main route to goal. Nevertheless, we didn’t learn anything new about these two sides. On the day Chile executed when chances were presented to them, as superior talent prevailed. Ecuador remains the team that can sustain pressure and pose a threat when they attack directly, whereas Chile has yet to identify a combination between exciting football and results. Despite being the inferior side for large portions of the match, Juventus’ clinical finishing proved decisive in their road victory at the San Siro. Clarence Seedorf was forced to make a few changes to his starting XI that defeated Sampdoria last week. The Rossoneri were without the suspended Sulley Muntari and the injured Mario Balotelli, so Nigel de Jong and Andrea Poli slotted into midfield. Also, Christian Abbiati, Urby Emanuelson and Daniele Bonera featured in Seedorf’s back line. Antonio Conte was without the suspended Arturo Vidal, while Giorgio Chiellini was sidelined due to injury. Claudio Marchisio and Martin Caceres slotted into Juventus’ rather predictable XI. Great teams find ways to win even when they’re not playing particularly well, and ruthless finishing enabled Juventus to replicate this feat. One of the peculiar feats regarding this year’s Milan side has been their tendency to perform against the top-sides, yet underachieve against lesser opposition. Despite the vast gap between both sides in the table, Milan was expected to raise their game at the San Siro, and their approach without the ball was pivotal towards their dominance for lengthy periods. Seedorf instructed his men to press Juventus’ back line when they played out of the back. Giampaolo Pazzini, Kaka and Adel Taarabt pressed Juve’s back three, while Poli man-marked Andrea Pirlo. 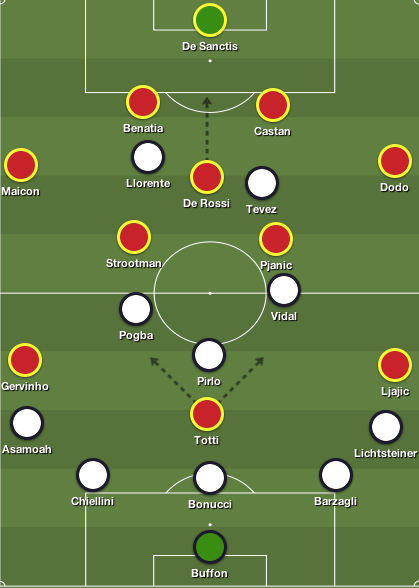 With Milan’s fullbacks quickly closing down Juve’s wingbacks, Conte’s men were unable to build attacks from midfield, and Milan were able to dominate possession. Milan negated Juve’s midfield by stifling Pirlo, and ensuring that distribution from the back was limited – without Vidal’s energy in midfield, Juve struggled to compete in central areas. The biggest surprise was Juve’s poor display in midfield. The aforementioned absence of Vidal was clearly a massive loss, and with Pirlo shackled, Claudio Marchisio and Paul Pogba were expected to carry the weight. Pogba, however, was languid in midfield, thus producing arguably his worst performance this season, whereas Marchisio’s runs from midfield were promising – it was vital in the build up – but his overall impact was minimal. In stark contrast, Milan physically imposed their authority in midfield. 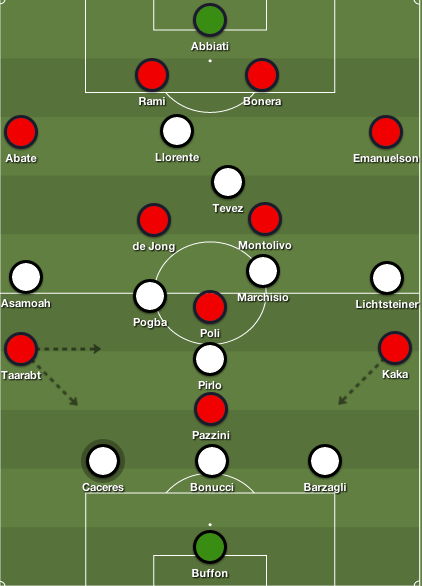 De Jong was fielded higher up the pitch, aiding Milan in retaining possession through pressing in Juventus’ third, whereas Riccardo Montolivo produced an extraordinary performance. He recovered the most balls in midfield (12), while his five interceptions and four tackles in midfield typified his overall impact. With Seedorf fielding Poli as his no.10, Milan’s creativity came from wide outlets. The movement from Milan’s wide men created space for Milan’s fullbacks to push into advanced positions, despite early pressure from Juve’s shuttlers. Ultimately, there were three elements to Milan attack. Fullbacks push forward: Emanuelson and Ignazio Abate’s advanced positions posed a threat for a short period. Buffon comfortably saved Emanuelson’s shot from outside the box, and later on, Taarabt overloaded the right flank with Abate, but the Juventus goalkeeper easily coped with his cross. Emanuelson continued to push forward throughout the half, and his ball into the box evaded Pazzini, and fell to Poli, but the Milan striker skied his shot over the net. Direct balls into Pazzini: Over the course of the first half, Juventus’ back three failed to cope with Pazzini’s movement. In the 8th min, Pazzini nodded down a long ball to Kaka, but his shot flashed wide of the net. Minutes later, Taarabt’s ball from the right flank were flicked on by Kaka towards Pazzini, but his header flew over the net. Towards the end of the half, the Italian did well to hold up the ball and turn on Andrea Barzagli, but Buffon comfortably held his tame effort. Kaka direct runs: Pazzini was behind Kaka’s first legitimate goal-scoring opportunity, as he beat Leonardo Bonucci to a loose ball and drove towards goal, thus leading to Kaka forcing Buffon to make a key toe save, and his rebound was cleared off the line by Bonucci. The Brazilian tormented Juventus later in the half, when he drifted infield from the left flank, but his curling effort was pushed aside by Buffon, and Poli blasted the rebound over the net. Lastly, his direct running from the left created space for teammates as well, as he squared a pass to Montolivo, whose effort was also saved by Buffon. Milan created an abundance of chances to take the lead, but a terrific showing from Buffon, along with woeful finishing prevented Seedorf’s men from taking the lead. While Milan struggled scoring goals, Juventus’ ruthless finishing signified the difference between both sides. Fernando Llorente’s opener stemmed from a simple long-ball that Adil Rami couldn’t clear, in which it fell into space that Marchisio ran into. The Italian located Tevez in the box, while Stephane Lichtsteiner’s forward run enabled him to latch onto the Argentine’s clever forward pass, and complete his cross for an unmarked Llorente to tap the ball into an open net. Juventus found more space in midfield in the second half, and it was evident when Tevez received time to fire a venomous shot off the crossbar to secure three points. Tevez, in general, displayed his significance to the side – his creativity created Llorente’s opener, and his goal-scoring prowess led to his fantastic strike for Juve’s second. In truth, he epitomizes a striker fit for Conte’s system. His willingness to press Taarabt in Milan’s third, thus creating a chance that Lichtsteiner shockingly missed, along with using his strength to easily brush aside Rami and force Abbiati to make a save illustrates what he offers Juventus. The Argentine’s remarkable goal was his 15th in 26 Serie A appearances, and it’s fair to say that not only was Tevez the best striker in the match, but he’s possibly the best in the league. Usually matches between two top-sides – disregarding the Milan’s position in the table – are decided by the narrowest margins. Although, Milan produced a positive performance, their inability to beat an impressive Buffon haunted the Rossoneri. The win puts Juventus in pole position to claim their third consecutive Scudetto, and this match indicated the significance of Llorente and Tevez’s arrival. The strike duo has formed an unparalleled partnership this season, as they combine superbly within the final third, while providing flexibility, consistent performances, and goals. One of the most difficult tasks managers have faced throughout the past decade is succeeding Jose Mourinho. Normally the introduction of a new manager ignites a spark in the dressing room, as players believe their role in the squad could be threatened or enhanced, but Mourinho’s departures presented a rigorous challenge at Real Madrid. The bond Mourinho builds with his players are usually inimitable – look no further than Didier Drogba breaking down into tears when Mourinho left Chelsea, or the footage between the Portuguese manager and Marco Materazzi after Inter Milan’s Champions League triumph. Drogba is one of the most dominant strikers of his generation, whom struck fear into the heart of the opposition backline. Likewise, Materazzi was a stone cold enforcer that didn’t tolerate nonsense – the former and the latter weren’t renowned for being emotional characters, so the tears shed during Mourinho’s departure exemplify his personal impact. It’s surreal to see grown men of their stature shed tears for Mourinho, but the decline his former teams encountered was alarming. Porto hasn’t come close to contending for the Champions League since their triumph in Gelsenkirchen, only now is Chelsea developing the consistency needed to challenge for the Premier League title – apart from their triumph in 2010 – while Inter Milan is no longer a contender for the Scudetto, nor are they in any European competition. However, Real Madrid was different. The Portuguese manager fell out of favor with the supporters and his players, thus leading to Mourinho’s first trophy-less season of his career – subsequently, Mourinho was sacked. Carlo Ancelotti was chosen to follow the path of Victor Fernandez, Avram Grant and Rafa Benitez, but unlike Mourinho’s previous sides, Madrid was eager to return to the top of Spain and Europe. The early stages of Ancelotti’s tenure were challenging, especially with the absence of Gareth Bale and Xabi Alonso, but Cristiano Ronaldo’s goals kept Madrid afloat. Yet, with the La Liga title race into the final stretch, Ancelotti’s men sit three points behind league leaders Atletico Madrid, and most recently battered their cross-town rivals by three goals in the Copa del Rey. Madrid remains undefeated in 2014, conceding one goal – a Ibai Gomez screamer – and Ancelotti believes balance has been pivotal towards their success. “The most important thing is the balance we have at the moment; it’s the key. We defend and attack very well,” Ancelotti said following a win against Granada. 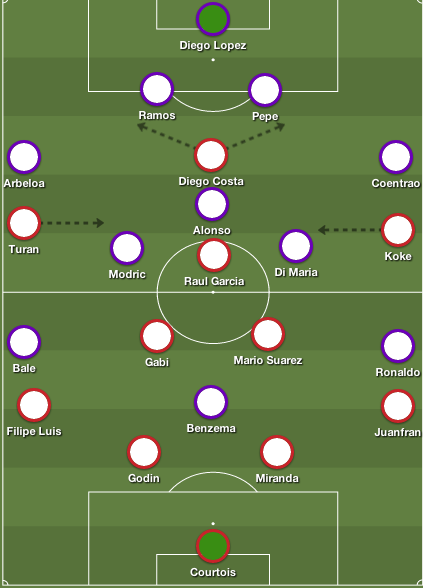 A key feat in Madrid’s hot form was the permanent change to a 4-3-3 that has seen Xabi Alonso, Angel Di Maria and Luka Modric form an imperious midfield trio. Ancelotti has always been keen on including playmakers in his midfield, to compliment his possession-based system by controlling central areas. Alonso is the deep-lying playmaker that connects play with the attack with long-diagonal balls. Di Maria is now playing in a role similar to the one he adopts for Argentina – he drives forward to join the attack, and while he does sit centrally, he ensures the opposition doesn’t overload the left-back. Then there’s Modric – a dynamic, diminutive, controlling playmaker that’s arguably been Madrid’s star performer this season. Modric’s first season at the Santiago Bernabeu was underwhelming by the Croatian’s standards, as he failed to adapt to Mourinho’s 4-2-3-1. Mourinho was keen on bringing in Modric after Toni Kroos’ terrific performance in the 2012 Champions League semi-final, and he believed the Croatian could fulfill the role. However, Modric was unable to settle in an advanced position, whereas his role in the double-pivot alongside Xabi Alonso left the Spaniard vulnerable against counter-attacks. Modric was unable to express himself in Mourinho’s two-man midfield, but he still provided moments of brilliance such as his Champions League goal at Old Trafford against Manchester United. Perhaps, with a mobile defensive holding midfielder Modric may have succeeded, but Mourinho was reluctant on playing two ball-playing midfielders in front of his backline. Yet, in the second leg of last season’s Champions League semi-final against Borussia Dortmund, Modric was the key man as Jurgen Klopp’s men aimed to nullify Alonso’s threat. United did this admirably in the round of 16, pressing Alonso and allowing Sami Khedira – not the greatest passer – to sustain possession. With Modric as the second pivot, Dortmund was unsure of how to cope with his threat. The Croatian completed 88 percent of his passes, but also freed up space for Alonso to influence the match. As time passed in Mourinho’s tenure, opponents began to realize the importance of Alonso, and even now, as Ancelotti has moved to a 4-3-3, Modric’s significance in the side has increased. Most recently in matches against Athletic Bilbao and Atletico, Modric was the key man – he provided an additional passing outlet when Alonso was pressed, and was Madrid’s most reliable passer, while providing penetration with his silky runs through midfield. Ancelotti who’s been an admirer of the Croatian for some time has recently praised Modric’s impact on Madrid’s attack. “His finest quality is getting through with the ball. At the start of the season he seemed to be a little bit lacking in personality but now he is displaying a lot of character, and it is very important to have personality. Modric is changing the rhythm of the way we play in attack,” Ancelotti said. Although Modric’s frail figure puts him at a disadvantage, nor is he the greatest tackler, the Croatian relentlessly hounds the opposition in search of possession. He’s usually the first man from midfield to close down defenders, as his dynamic presence forces his opponent into mistakes. In attack, the Croatian nonchalantly glides from box-to-box evading challenges reminiscent to the ones he received as a 17-year-old while playing at Zrinjski Mostar in Bosnia. Modric feels that experienced helped him toughen up, as the hits inflicted and the nature of the game was rough. Nonetheless, it’s Modric’s passing ability that is often overlooked. The Croatian’s ability to retain possession is extraordinary – he quickly switches the route of attack from flank to flank, and his willingness to play a penetrating pass is invigorating. Only Barcelona’s midfield trio – Xavi, Andres Iniesta and Sergio Busquets – better Modric’s 90 percent passing rate in La Liga. In terms of assists, tackling and pass completion rates, this has been the Croatian’s best season of his career, as he’s slowly molding into the player many Madridstas envisioned. “I’m in great form right now. 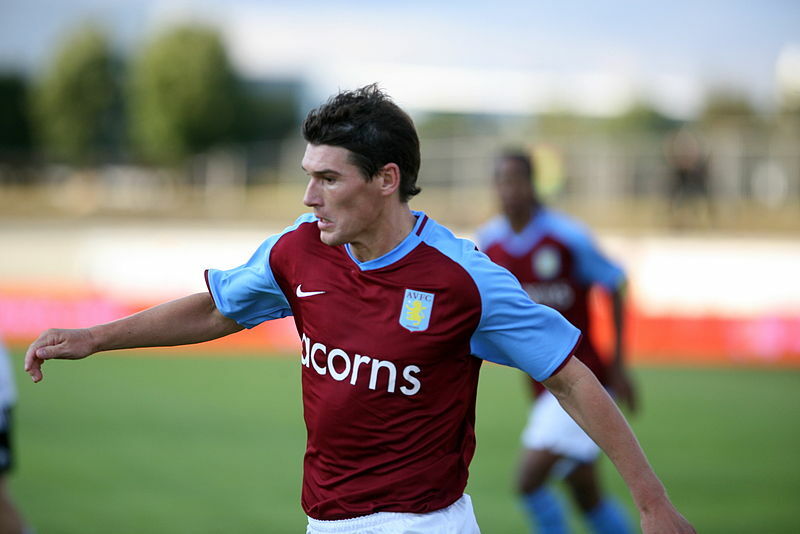 Playing in pre-season was important for me. It’s key to have the coach’s fully backing and trust. That’s why I’m playing better. I also have a great relationship with the fans. They’ve always had my back and that has made things easier for me,” Modric told Marca. Ancelotti’s decision to modify his formation has been beneficial – despite a sudden Ronaldo goal-scoring drought. As devastating as Ancelotti’s men can be in attack, their overall shape without the ball has improved with an extra man in midfield. Di Maria diligently moves to the left to prevent overloads, while Gareth Bale, and Jese complete their required defensive duties. Now, Madrid is consistently keeping clean-sheets, and their midfield trio has provided a mixture of proficient passing, guile, grit, and dynamism. Ancelotti’s Madrid is finally taking shape, and with Barcelona encountering issues both on and off the field, and Atletico’s slim squad, a cup double isn’t far-fetched. Modric, however, has flourished under the side’s new possession-based system, producing genuine world-class performances. Twelve months ago, the Croatian was voted as the worst signing of La Liga, now, he’s become a key cog in a Madrid shirt – Modric can finally call the Bernabeu home. Lazio held Juventus to a 1-1 draw at the Stadio Olimpico despite Gianluigi Buffon’s first half dismissal. Edy Reja made several changes to his starting XI. Miroslav Klose led the line with Hernanes and Antonio Candreva playing behind the German international. Luis Cavanda and Abdoulay Konko played as wingbacks, while Cristian Ledesma and Lucas Biglia formed a midfield duo. Antonio Conte recalled Carlos Tevez and Fernando Llorente upfront, while Paul Pogba, Stephan Lichtsteiner and Kwadwo Asamoah took up their traditional positions in midfield. Both sides created little from open play – Juventus pounced when opportunities were presented, while Reja’s cautious approach prevented Lazio from increasing their lead. A draw was a fair result. Juventus found it relatively easy to move forward as a unit due to Lazio’s lack of press. Conte’s back three were free to push forward and play passes amongst one another because they were often in 3v1 situations against Klose. Occasionally, Hernanes joined Klose and pressed Conte’s defenders, but there was always a spare man, while Marchisio dropped into a deeper position to receive the ball. For the most part, Reja’s men dropped into their half and focused on maintaining a compact shape in midfield. Conte’s backline were free to play forward passes into midfield, thus leading to Juventus’ superiority in possession. Despite sustaining a mere 38% of possession in the first half – with a man advantage – Lazio went into half-time with a one goal lead, containing Juventus’ main threats. Reja’s men dropped into a 4-5-1 without the ball, and encouraged their wingbacks to quickly close down Lichtsteiner and Asamoah. 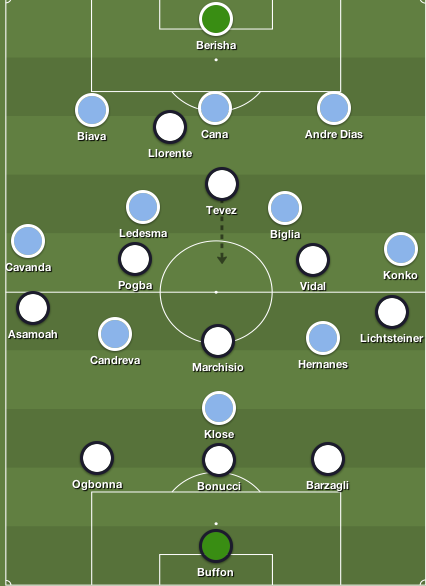 Lazio’s narrow shape limited space in central areas, meaning Pogba and Vidal struggled to influence the match from midfield. The main issue Juventus encountered was service to their strikers – Llorente was a peripheral figure in the first half, despite being involved in Juventus’ only legitimate goal-scoring opportunity, and Tevez found it difficult to receive the ball. Biglia and Ledesma protected the back four, while Lorik Cana and Giuseppe Biava also closed down the Argentine when he received the ball. Reja’s reactive approach was beneficial in the first half as Lazio nullified Juve’s attack. Shockingly, Lazio was in the lead at half-time courtesy of Candreva’s spot kick that was initially created through Konko’s magnificent through ball to Klose – which led to Buffon’s sending off. Buffon’s sending off forced Juventus to reshuffle, and Conte sacrificed Asamoah, thus leaving him without a left-sided player. Juve became a 4-4-1, with Tevez drifting to the left and Ogbonna playing as a left back. The onus was on Juve to attack, but with Lazio maintaining a man-advantage, one would expect the home-side to dominate possession. Conte’s men tried to play through the middle, and with Tevez slowly growing into the match, Juventus’ buildup play improved. With Ogbonna playing as a make-shift left back, Marchisio drifted infield so Lichtsteiner could push forward to provide width. There was no significant change in either sides approach for the remainder of the first half – Juve dominated possession but struggled to create legitimate goal-scoring opportunities, whereas Lazio sat narrow, defended deep, and opted to launch quick counters. The games most proactive players subsequent to Buffon’s sending off were Tevez and Hernanes. Both players flourished in different roles – Tevez worked off Llorente as an energetic second striker, whereas Hernanes sprung quick counter-attacks when Juventus conceded possession. Tevez’s influence on the match increased when Juve went down to 10 men. The Argentinian striker was positioned on the left, but when Juve won possession he moved into spaces on the field that Lazio’s defensive six wouldn’t drift into. Now, Tevez linked play with the midfield, allowing them to move into key areas, but the Juventus striker also posed a goal threat around the 18-yard box. His main contribution was the buildup to Llorente’s goal – Tevez received Marchisio’s pass in space and distributed the ball wide to Lichtsteiner, and his back heel played in the Swiss wingback, thus leading to the cross that Llorente nodded into the far corner. Hernanes offered a different threat – his quick nimble feet allowed the Brazilian to evade challenges and drive forward, and he was the main outlet on the counter-attack. On two separate occasions Hernanes ran at the heart of the Juventus defence before playing balls out wide, but Candreva wasted both attempts. The Brazilian summed up Lazio’s approach – he was disciplined without the ball, but crafty and direct on the break. Both men provided the invention that the match lacked, but their teammates were unable to make the difference. Juventus continued to dominate possession for large portions of the second half, but their approach was slightly different. 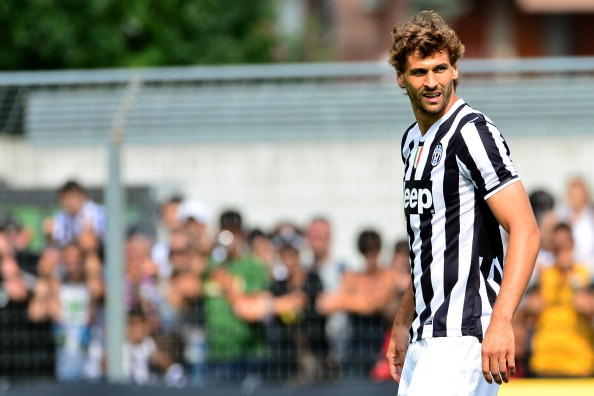 Conte instructed his men to utilize Llorente and play long balls into the Spaniard. There best chance stemmed from Bonucci’s direct ball into the striker, who held it up for Vidal, and the Chilean played in an onrushing Tevez, but his near-post shot was pushed away for a corner. Majority, of Juventus’ attacks were now based on the counter, but their transitions were slow, and their passing around the final third was poor. Nonetheless, for a side that played with a man advantage for the entire second half, Lazio disappointed. When they managed to sustain possession in Juventus’ third, they failed to get behind or penetrate Conte’s organized side. Apart from Hernanes’ involvement on the break, the home side was presented with two opportunities to win the match. In the span of four minutes, Klose got on the end of two Ledesma free-kicks: the first header led to a sensational save from Marco Storari, while the second attempt was offside, yet Storari caught the German’s tame effort. Reja made two substitutions in the half, introducing Alvaro Gonzalez for Cavanda and Keita Balde for Candreva. Keita provided a pacy direct threat in the final moments of the match – here, he constantly ran at Lichtsteiner, and Klose played the Spanish-born Senegalese striker in on the break, but his curling effort hit the post. Both sides were sloppy in possession, and they adopted direct approaches that nearly paid off. However, the match lacked guile, and creativity in the final third, but neither side was willing to gamble, thus leading to an uneventful second half. Juventus’ poor run of form at the Stadio Olimpico continues in a match that possessed two distinct features. Lazio’s reactive approach contained Juventus for large portions of the match, but their transitions were disappointing. Meanwhile, Conte’s decision to play through Llorente in the second half nearly secured maximum points. “We knew Juve came forward with one striker who’d flick it on for the other, so we worked on closing down those vertical lines. There’s also Arturo Vidal who moves down the right and Andre Dias was ear-marked to close down whoever went down that line,” Reja said. Buffon’s sending off changed the course of the game, but the likelihood of this match being a spectacle was very low, based on Reja’s approach. The draw leaves Roma six points behind the league leaders, and they’ll ironically meet Conte’s men at the Stadio Olimpico on the final day of the season, where Juventus can avenge last week’s shortcomings.